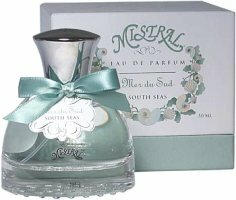 ...South Seas Perfume makes its own elegant splash. Born in the rippling turquoise waters of the South Seas, this fragrance captures the invigorating spirit of the tropics. Blended from faint splashes of citrus, ocean breezes, lush white flowers and warm woods, our South Seas Perfume evokes freshness and tranquility. How cute is that bottle?! So very cute. Perfume itself sounds kind of run-of-the-mill ocean frag though. Mistral has very cute packaging! I have not tried a single one. I think you can find them “in person” at Anthropologie. I think that Mistral looks vey much like some sort of copy of L'Occitane.. Very similar styles, I agree MW! I hadn't even noticed, but I guess it does! Love the packaging, but I'd take off the bow pronto. Their Vanilla Apricot is quite yummy – I have the shower gel and bubble bath. It actually smells a bit chocolatey. They used to sell it at Nordstrom's, not sure if they still do. Thanks, didn't know Nordstrom had them too. That bottle is wearing a hoop skirt. And an apron. Ah, are the soaps lovely? I'll have to try them. It is true I don't always love sweet, but Balinese Vanilla sounded really nice. The Balinese vanilla is knock-your-socks-off. I used it this morning! I'm wanting to try the South Seas and the Lychee Rose, too. Thanks! I still haven't seen a tester anywhere. Hi! I received a tester of the grapefruit and currant after placing an order with b-glowing. They carry the entire line. Lucky you, hoped you liked it! I find the Mistral fragrances are very unique, yummy, delicious and very differently. I have samples for my wife ordered sample vials. She loves the scents and those are not any copies of any other fragrances or selective brands. I wait to this fragrances avaliable in German market. I think the Mistral fragrances become very popular in Germany. Even i as a man love this fragrances. I hope in near future bringing Mistral fragrances for Mens too. Glad you & your wife like them.